Tristan da Cunha is remote, by any standards. But within the archipelago that Tristan encompasses, there is an island that is considered remote even by the people of Tristan. Around 220 miles further south from Tristan is Gough Island, named after Capt. Charles Gough of the ship called the Richmond, who discovered it in 1732. 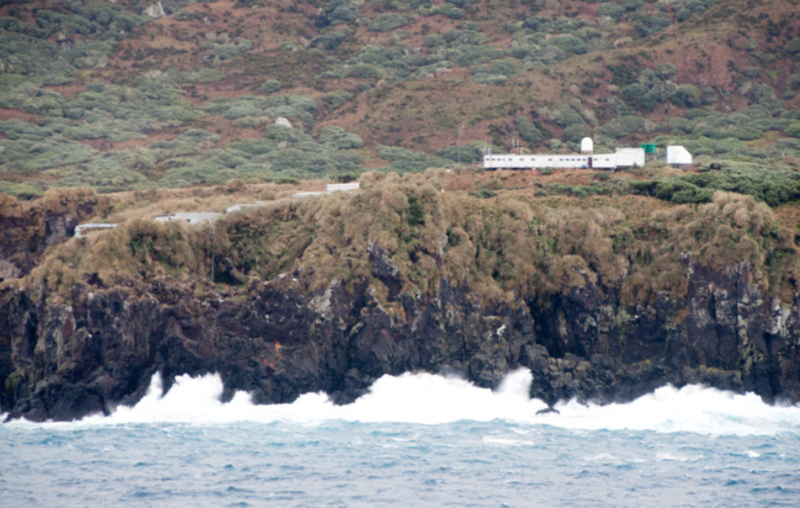 Gough Island is around 13 km long and 5 km wide. It is home to around 10 million seabirds as well as two species of land birds – the Gough Bunting and the Gough Moorhen. In recognition of Gough being a hugely important place for bird life, with a unique largely unspoiled habitat, the island became a UNESCO World Heritage Site in 1995. It’s classification was added to by being joined by Inaccessible Island (another small island in the Tristan archipelago) in 2004. Gough Island is uninhabited. However, for the last 62 years the South African Weather Service has had a lease arrangement with the Tristan Government, and during this time it has maintained a scientific base on the island. Teams of staff spend an uninterrupted 12 months on the island, the main purpose of which is to monitor weather conditions in order to help with the forecasting of weather in southern Africa. In addition to the meterologists, the team includes engineers and a medic. There are also normally three staff from the RSPB (Royal Society of the Protection of Birds) who are bird scientists, and whose job it is to monitor the bird population on Gough. 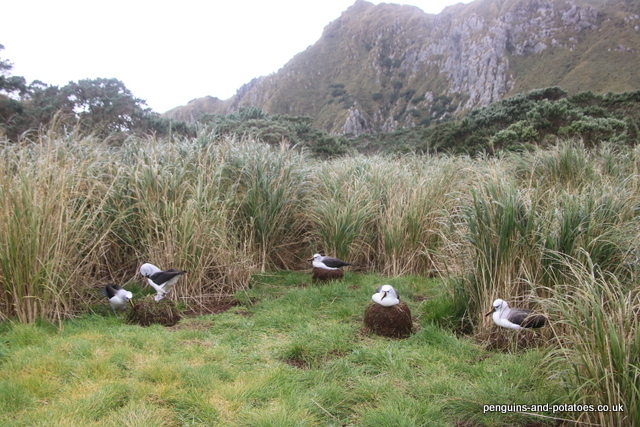 The importance of Gough can be seen, for example, in the fact that 99% of the world population of Tristan Albatross nest on the island, and 100% of Gough Buntings nest there. Both species are critically endangered. There are also populations of a large range of other Albatross, Shearwater, Petrel and Prion species, some of which are also classified as being endangered. Around 2006, the use of camera traps was able to prove conclusively what a few observers had already suspected. This is that mice were predating on the wild bird chicks. Mice had been on the island for many years, probably brought there originally by sealers in the 19th century. The mice lived in harmony with the bird population, their diet consisting of plant seeds and insects. Then – they evolved into chick-eaters. This evolution, the change in eating habits of mice, has been seen in a parallel situation on Marion Island, where by means of careful monitoring during the space of just four seasons, ‘normal’ mice had evolved into predators of bird chicks. The scale of this predation on Gough is enormous – in 2016 it was estimated that mice were responsible for the killing of 600,000 chicks. Following a scientific study on Gough some weeks ago, this has now been revised and updated to 2 million chicks and eggs a year. 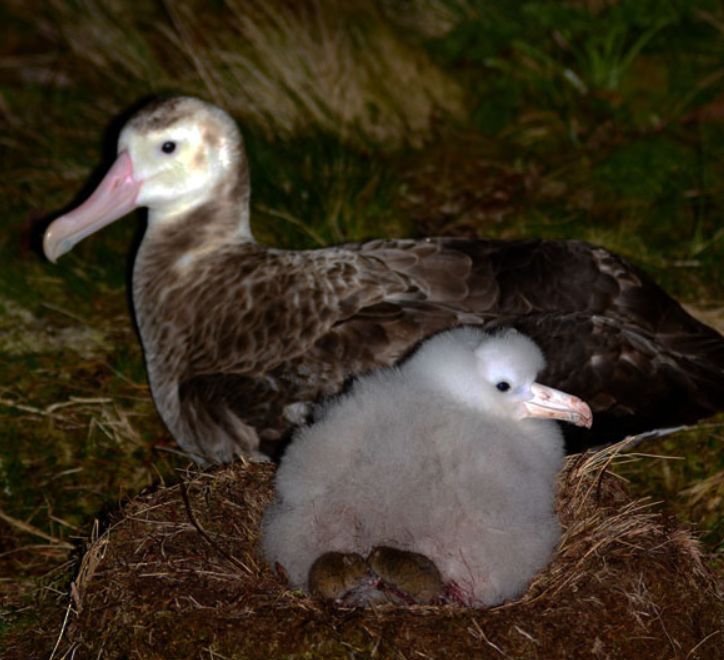 There have been some quite gruesome pictures of groups of mice eating albatross chicks alive. 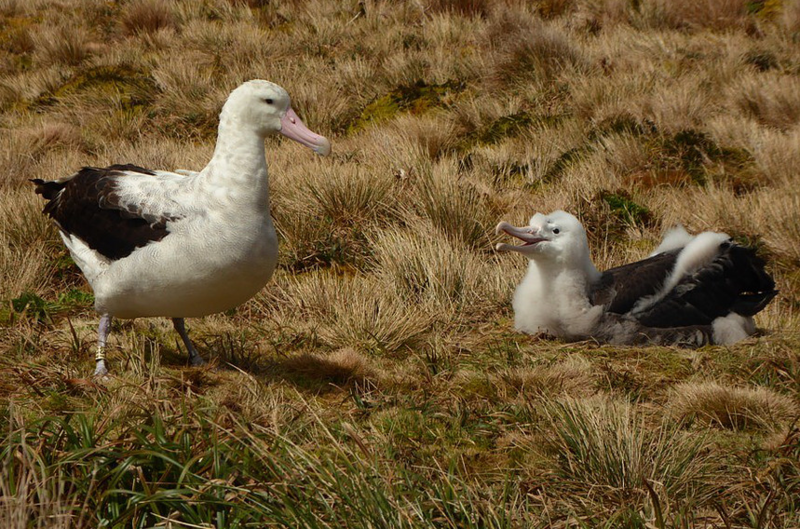 The interesting thing is that the parent albatross just looks on unconcerned. One stab of the adult albatross beak could easily kill a mouse, and bear in mind that an adult albatross might weigh 2 kg as compared to a mouse of about 25 grams. The problem is that the Albatross (and other species) have nothing in their genetic makeup to tell them that mice are dangerous. The RSPB team stationed on the island, together with visiting specialists in September / October this year, came up with some alarming figures. For example, they found that this year the population of the critically endangered Tristan Albatross reared just 309 chicks from of 1,435 nests – only 21% instead of the 80 – 100% that would be the target for the species to have a long-term future. In recent years, just as there have been huge technical advances in camera traps and other monitoring devices, so also there have been major advances in rat and mouse eradication from islands. Islands lend themselves to eradication programmes since, provided that strict bio-security measures are introduced and enforced, re-infestation can be prevented, whereas in any mainland situation re-infestation is inevitable. There have been some highly successful island eradication programmes, including from South Georgia, Macquaire Island off Australia and Campbell Island off New Zealand. All of these programmes have used helicopters with underslung spreaders that distribute pellets made of a cereal-based toxic bait. The spreaders are standard agricultural fertiliser spreaders fitted with a small Honda engine, and the bait generally used is one of the second-generation anticoagulants called Brodificoum. 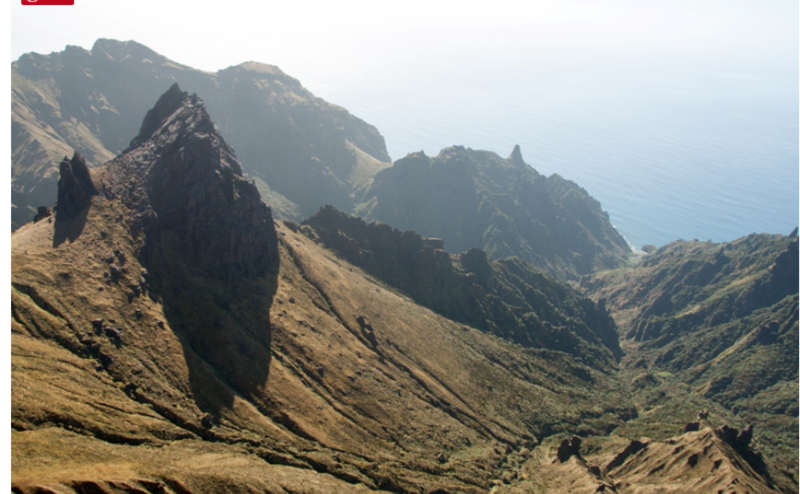 The world centre for this eradication work is New Zealand, and it was that country that the RSPB turned to when it set about the planning stages of an eradication programme on Gough Island. Initially, the plan was to carry out the eradication programme in the winter of 2019, but this has now been postponed to 2020. The winter months are chosen because it is at that time that there are no birds nesting, and the mice are keen to find all food alternatives – making them eager for the toxic bait that is used in the eradication programme. In August + September this year, a small specialised team travelled out on the SA Agulhas 2, the ship used by the South African Government to conduct their annual maintenance and team-change visit on Gough Island. This team was organised by the RSPB, and consisted of an eradication specialist and a specialist helicopter pilot (both from New Zealand), an aerial systems engineer, and a bird captivity and release specialist. The purpose of the visit was to have a detailed look at the site so that they could modify and confirm a master-plan for the operation, in order to give this expensive operation the highest possible chance of success. The overall plan is that in the early winter of 2020, a logistical team will travel out to Gough Island, to take out stores and set up accommodation on the island – a team of around 30 people will be needed. The bird captivity and release specialist will be in this advance party. His role will be to set up a large aviary-type structure, and to capture a good number of buntings and moorhens to act as a security population. If these species suffer from poisoning of the toxic bait, at least there will be a protected reserve of such birds in captivity, available to be released when the active bait is no longer present on the island. The albatrosses and the rest of the sea birds do not pose a problem in this respect – the do not come to the island during this time of year, and in any case they do not eat while they are onshore. Once all the on-island preparations have been completed, the dosing team will travel to the island on a second ship. This team will include four helicopters (one as a reserve) and a whole team of specialist pilots. The systems engineer sets out an electronic GPS-based grid pattern of the routes to fly to ensure 100% coverage – indeed each swath is arranged to give 50% coverage of the previous swath, thus arriving at a double dose of the toxic pellets for any given area. Two applications of bait would be spread, ideally 3 weeks apart for maximum effectiveness. The winter in these latitudes can be very severe, and it is anticipated that with any lull in the weather the team will have to work from dawn to dusk, to seize the opportunity before the weather closes in again. No-one is pretending that the task will be simple. Mice are more difficult to eradicate than are rats, partly because they can find protection from the weather (and the toxic bait) in all sorts of caves and holes. The whole project is expected to cost in the region of £9 million. The success of the project will be measured by two elements. Firstly, 100% kill of the mouse population is needed. If a single breeding pair remain, then the breeding birds will just have a short respite until the mouse population once again builds up to the present levels. Secondly, it is vital that the bio-security arrangements in Cape Town and on the island must be so thorough and so effective that there is no possibility of the re-introduction of mice in the future. I am sure that everyone involved in the project knows full well that they have just one chance to succeed.